The popularity food trucks have sky-rocketed over the past several years, and for a good reason. Practical, cost-effective, and very lucrative at the same time, food trucks can offer a quick return on your investment. This booming industry recorded more than $800 million in revenue with annual growth over 9% last year and all indicators show a steadily rising trend. Although this is a very popular business, the food truck niche is a highly competitive one, especially in the large cities. Many food truckers use social media to stay in touch with existing patrons, but recent changes in Facebook’s algorithms are making it harder for businesses to get their posts seen. Traditional paid advertising, including social media is not really designed to maximize mobile and location technology and certainly not focused on driving foot traffic to your location, but that’s all about to change with Facebook Local Awareness Ads. Just as their name suggests, these ads are specifically designed to create local awareness around a specific area, usually limited to a radius of 1-50 miles around your local address. Facebook local awareness ads are specifically designed to drive foot traffic to your location and the lowest possible cost. This means if you are a service company that does work at your customers location these ads are likely not a good fit for you. 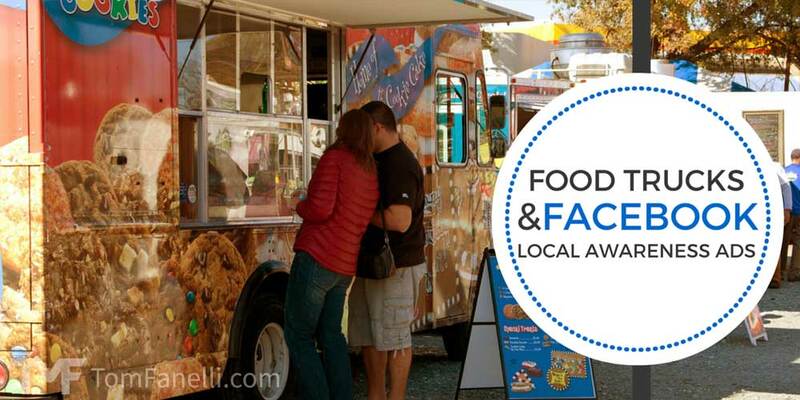 There are several reasons why every food truck owner should consider Facebook Local Awareness Ads, I will outline a few below. Your Food Truck Changes Location, How Do You Get The Word Out? Facebook’s new Local Awareness Ads are designed to target people that are presently located in your defined radius. This means that if you want to move your truck to a new location and target a new office complex you can spin up a campaign and get the word out to everyone in that local area. Sure beats sending someone around to hand out flyers! Let’s say you want to get the word out to new customers, with Facebook Local Awareness Ads its really simple. You will not have the level of control you have with existing Facebook Ads, but I am certain they will add more features. For now, you can filter by gender and age, so make the most of them. If you cater to mostly women, then you can target that segment, if you target “20 somethings” you can set that as well, you get the idea. In addition to by gender and age, you also have the ability to set your ad display times associated with your budget. This means you can set your ads to display just during lunch hours which will maximize your spend during your most active business hours… or maybe not! You could use this during off hours to generate additional traffic when it’s a slow time, there are so many possibilities. Get creative and test several scenarios, if you are slow between 2-5pm offer an afternoon latte coupon to the people in the area to generate some buzz. Coupons, Incentives, and Deals, oh my! The primary call to action on a Local Awareness Ad is “Get Directions”, this is a critical part of how Facebook intends to drive actual store (or food truck) visits. Unlike traditional Facebook Ads where you can have a call to action to claim an offer, you cannot on Local Awareness Ads. This means you need to make mention of it in your post or image. Keep in mind Facebook doesn’t allow images with more than 20%. 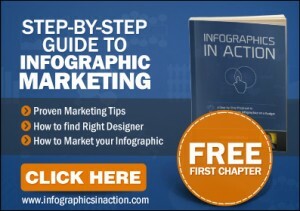 If you need help with this issue there is a great article over at Jon Loomer Digital that talks about how to get around this and measure your image text density. Do not underestimate the power of a special offer to your “future” customers. If they are in the right place at the right time and have the right offer you have a high probability of attracting them to your food truck. I mentioned earlier the primary call to action is “Get Directions”, this is a really important detail of these new ads. The reality is we do not yet know enough to forecast what the drop-off rate will be in terms of the number of people who click “Get Directions” and those who actually show up. Most of the location-based tech that is in place today is in its infancy. I think Facebook will quickly become a major provider of this data and as more people starting using Location Awareness Advertising the industry will quantify this metric. For food trucks, I think the most compelling part of this is how easy it is to change your location in Facebook for your ads. The transient nature of food trucks and ease of changing advertising location in Facebook offers a unique solution to food truckers that almost seems to good to be true. In other words, the conversion rate (turning your potential customers into actual buyers) is higher if you advertise your business locally, and this is precisely what the local awareness ads aim to help you do, at the lowest costs possible. Launching a local ad via Facebook is a simple and hassle-free process, as all you have to do is to select the desired area, to upload a photo and to come up with a brief yet catchy headline and advertising message. Facebook will then display your food truck business to local users: you get to select the desired perimeter, and your budget will determine just how many people will see your ad. It is up to you to decide how much money you want to spend on this short yet highly efficient advertising campaign: once you select the budget and the length of the campaign, Facebook will then offer you an estimated number of ad displays. What Makes The Facebook Local Awareness Ads Stand Out From Other Forms Of Geo-Targeted Advertising? One of the many aspects that make these ads stand out from the crowd is the fact that the user has full control over the campaign: it is entirely up to you as a business owner to select the perimeter (you can set a radius as small as a mile! ), and Facebook will display the targeted ads only to those users who are within that range. Moreover, you can gain access to in-depth statistics and charts that will help you monitor the progress of your advertising campaign in real-time. This allows you to then edit the details of your campaign, as you wish: for instance, if you are satisfied with the conversion rate, you can buy more ad displays by adding more money to your account. On the other hand, another very important aspect is that the local awareness ads program is very versatile, feature-rich, user-oriented and it comes with a highly intuitive interface: unlike it happens with other geo-targeted advertising program where a professional marketer/advertiser does the job on your behalf, you are the one who runs the campaign here. There is even a mobile application that allows you to access your account from your tablet or smart phone, and this is very useful for those who are always on the go, yet who want to keep an eye on their advertising campaign. Currently Facebook Local Awareness Ads are only available in certain parts of the country, but they are rolling out to 100% of the United States in 2015. My gut tells me these will work better in highly concentrated areas of the country like major cities. I am basing this on proximity being a factor in the likelihood of a person to convert to a sale. Meaning, the closer a person is to your location increases the chances they will actually make it to your place of business. There will be a window of time, albeit likely short, that these will be new and not highly saturated or competitive. If you have a business that fits the Local Awareness Ad model then I would recommend jumping on these as soon as you can and testing them. You might be surprised with the results and have a great source of low-cost new business. Do you plan on using Facebook Local Awareness Ads? Share your thoughts in the comments, I would love to hear from you.